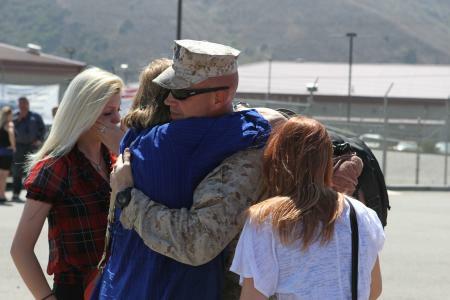 More than 1,000 Marines with 2nd Battalion, 5th Marines, have returned from Afghanistan to Camp Pendleton, Calif., since Friday, the culmination of their seven-month deployment in northern Helmand province. As this Marine Corps news release points out, the unit was based primarily in Musa Qala and Now Zad districts, teaming with other units as part of Regimental Combat Team 6. Other infantry units in that RCT this summer included 1st Battalion, 8th Marines, out of Camp Lejeune, N.C., and 1st Battalion, 7th Marines, out of Twentynine Palms, Calif., both of which photographer James J. Lee and I visited this spring while embedded with Marine forces downrange. Maj. Gen. Charles Gurganus, the top Marine commander in Helmand, said during an interview in May that there would be just two infantry battalions in the region by this fall, and that has held true. With 2/5 and 1/7 coming home this month, the remaining unit in northern Helmand is 2nd Battalion, 7th Marines, which will be distributed across Musa Qala, Sangin, Kajaki and other districts nearby in a security force assistance role. For the time being, 3rd Battalion, 8th Marines, out of Camp Lejeune, N.C., will continue in a similar role in southern Helmand. They assist the Afghan army and police in Marjah, Nawa, Garmser and other districts in the region. You are half correct…approximately one half of the 2/7 battalion has deployed. Please continue to follow this story of the 2/7 because this plan seems premature and very risky to the great Marines of the 2/7. Just elements of 2/7, eh? That’s the first I’ve heard of that. I’ll keep tracking. Thanks Dan. Please keep following the deployment of the 2/7 in Afganistan. My son is a member. He is in Fox Company and did not deploy, many or most of the company did. I believe that Weapons company did not deploy. Those that have not deployed are considered repalcement troops. My son pre-deployed in early September from the 2/7. He is evidently in Sangin currently. The full battalion has evidently not deployed.